Whether you’re a dedicated cook or more of a casual kitchen user, your kitchen is always going to be a room that sees high traffic and heavy wear and tear. If your kitchen is starting to show signs of use, or if it’s just starting to look outdated, it might be time to come up with some ideas for bringing it into the present — and then you can bring Willow Tree those ideas. One of the most consistent modernist kitchen style trends is the white kitchen, a sleek adaptation of a classic style. But there’s a lot that can be done by incorporating color as well. 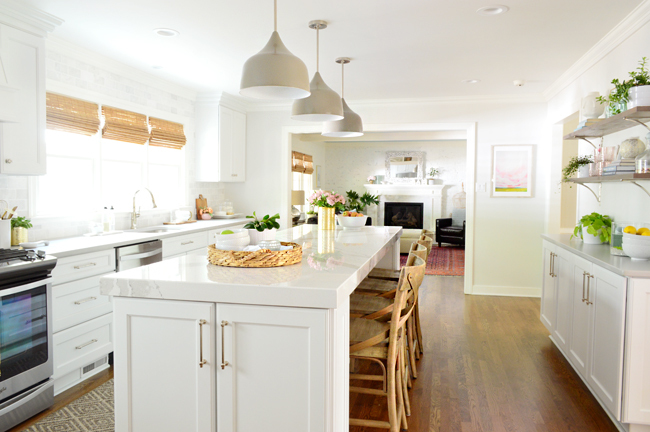 This classic white kitchen remodel by stylist and TV host Emily Henderson is fresh and clean with its white cabinets and brass handles. But Henderson also chose to ground it with a healthy helping of navy paint to ground the space on the lower cabinets. This also serves to disguise scuffs and create contrast with the white and brass reclaimed chairs. This kitchen started with a dark, dated wood paneling vibe. Blogger Sara D and her family updated it with lots of white paint and carefully chosen fixtures. 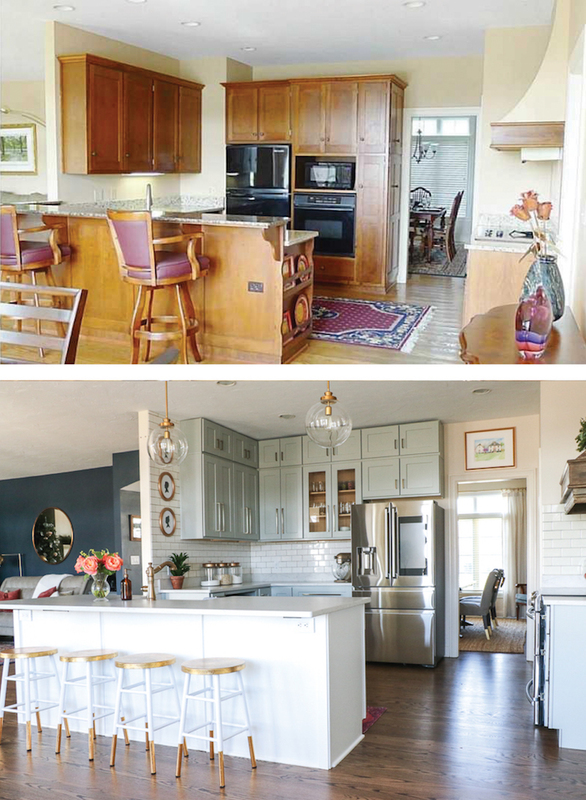 Their chosen centerpiece was a farmhouse sink with a bronze faucet, proving the power of prioritizing in choosing exactly which pieces are worth a splurge to get the look you love. Sometimes, going modern means going old. Mixing in a few key antique items in a white kitchen created this modern but livable look for Shaunna of Perfectly Imperfect. She chose an antique door for the passageway from the kitchen to the laundry room and opted for some traditional wooden chairs to sit at her counter. 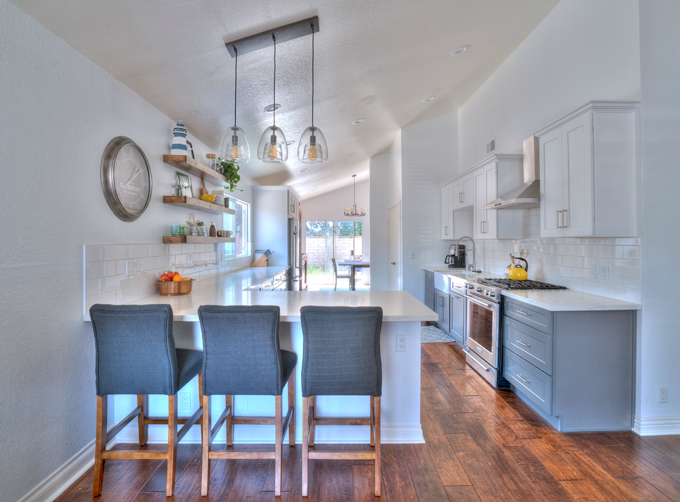 For this kitchen remodel, food blogger Kelsey chose to knock down a wall to create a much more open space. Her restructuring didn’t stop there, as she added multiple rows of blue gray drawers to create storage and add a gradient stage to the cool white of her repainted walls and tiled backsplash. Abby Lawson’s kitchen model centered on taking massive amounts of faux wood laminate and transforming it into a clean white space. But she also wasn’t afraid of adding texture through strategic use of prints. A leafy print half curtain and elegant area rug made this space unique and colorful. One of the most key anchoring elements of any kitchen is the backsplash. For Laura Gummerman, that tiled wall behind her sink and counter added the perfect pop of color to a white kitchen redesign. 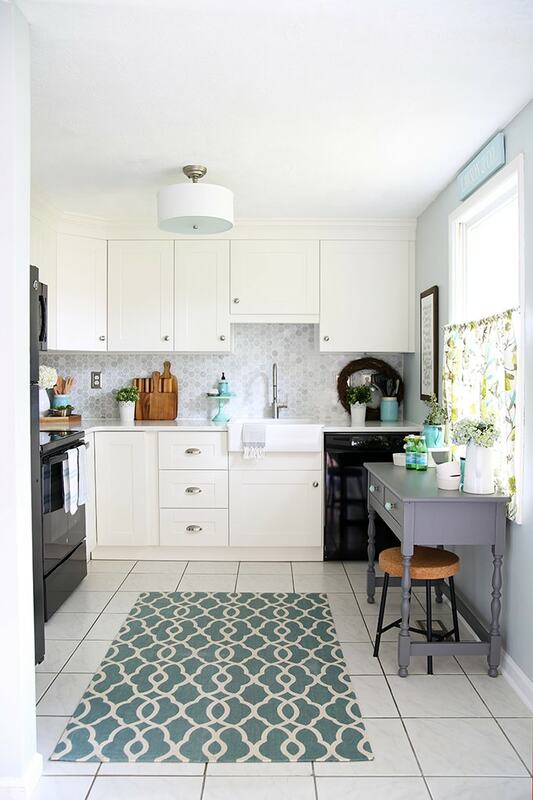 Rather than splurging on a full replacement backsplash immediately, she painted over the old brown tile with a bright teal. Laura’s kitchen remodel also featured a custom created stain for the floor, grounding the white cabinets and shining brass fixtures with a dark wood look. John and Sherry of Young House Love created a classic white kitchen, but warmed it up with strategic uses of natural wood. 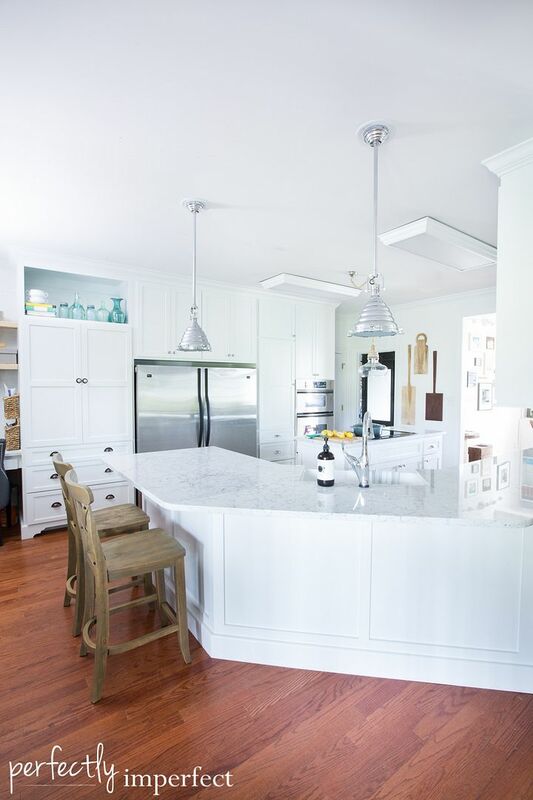 They balanced a beautiful quartz island counter by pulling up some simple wooden stools. The bright, modern light fixtures were tempered by woven blinds over the windows. The floor itself is a warm, honey colored wood. Now that you have some idea of what your updated kitchen might look like, how do you make these visions a reality? Willowtree can help! Invite us into your next construction and remodel dream.